I’m going to ask you a series of questions, if your answer is yes – or maybe – continue to the next question. If your answer is no, you can stop reading and move on to the next article on AP. Got it? Let’s begin. Do you enjoy listening to Frank Sinatra? How about a guy who sings like Frank Sinatra, but doesn’t wear a fedora? 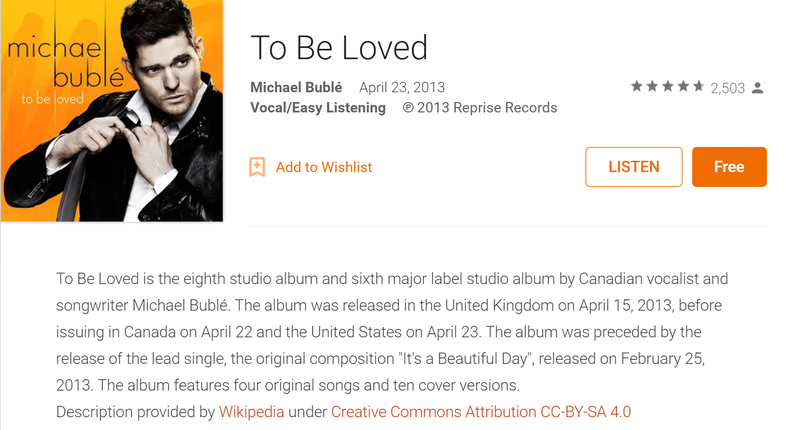 Yup, the guy I’m talking about is Michael Bublé; do you like him? What about infectiously happy love songs, do you like those? Well then, I've got a free album to share with you that you will enjoy. It's called 'To Be Loved' and it's happier and sappier than a maple tree in Candy Land. I'm not kidding, here are some of the titles – To Love Somebody, Who's Lovin' You, To Be Loved, Nevertheless (I'm In Love With You), and Have I Told You Lately That I Love You. That's a whole lot of love, and it's yours for free. You're welcome, you love-sick puppy you. If the romance this album inspires leads to a child nine months from now, just remember who told you about it. Jeff is a mighty fine name.